The Pentium MMX is a processor for the popular Socket 7 platform. This platform is often used for building a hybrid MS-DOS and Windows 98 SE Retro Gaming PC. Often in combination with mobile K6 processor which lets you change the multiplier on the fly, as well as toggle CPU and Motherboard Caches to slow it down for older, speed sensitive games. This works well, but there are large gaps of speeds that cannot be achieved, for example that of the classic 486DX2-66. ​On the right hand side we have results for a few reference PCs, and what is exciting is that with a Pentium MMX and SetMul, most of these reference PCs can be perfectly replicated in terms of their speed. There is a gap around the DX4 processors, and also at the bottom end. The Pentium MMX is a bit too fast to reach down to an average 386 for example. To further slow it down, to reach that 386 and perfect Wing Commander speed, an ISA Graphics Card can be used. For example a Trident graphics card got me down to 10 FPS, whereas an OAK graphics card to an even lower 6.6 FPS. The speed of RAM also comes into play here. Try increasing wait states, or slower timings. Some motherboards take two types of RAM, so here using the older type can also help. Just run them, with SetMul present in the same folder, for easy dialling in the speed of whatever game you're playing. Find the batch files ready to download for you convenience. Benchmarking is fun, so I always try to make it as easy as possible for others to get involved. On the right you can find the benchmark pack, ready to go, as well as a results sheet to print. Just unzip the folder, then run the STMLBNCH.BAT batch file. It will run the popular 3DBENCH2 benchmark. Write down the first result onto the sheet. Then press ESC, and it will commence with the next benchmark run. Record the results. Rinse and repeat. There are a total of 17 runs, but this needs to be repeated a second time with the Motherboard Cache disabled. 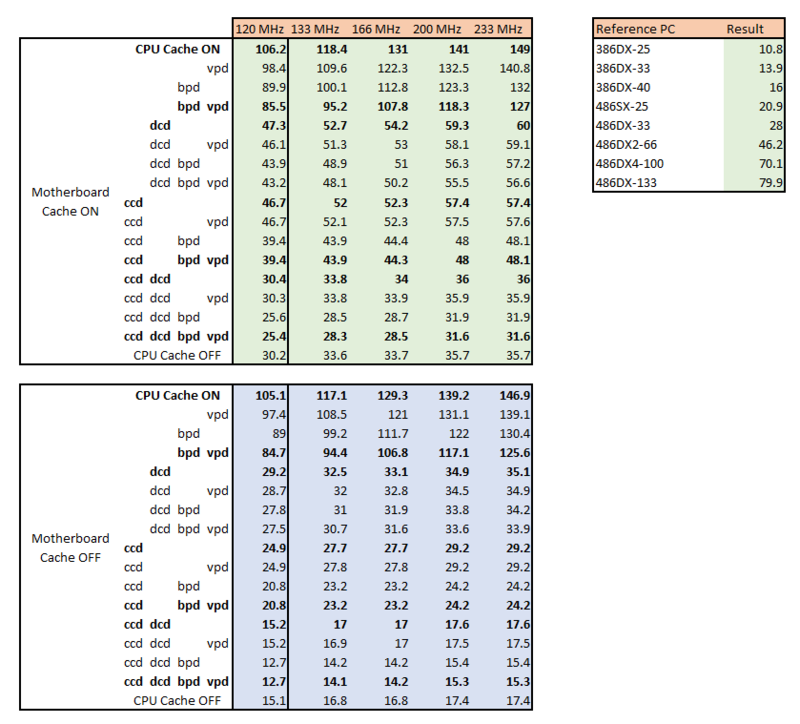 Benchmark Sheet for the 136 in 1 CPU Project. Unpack this onto your Retro PC. 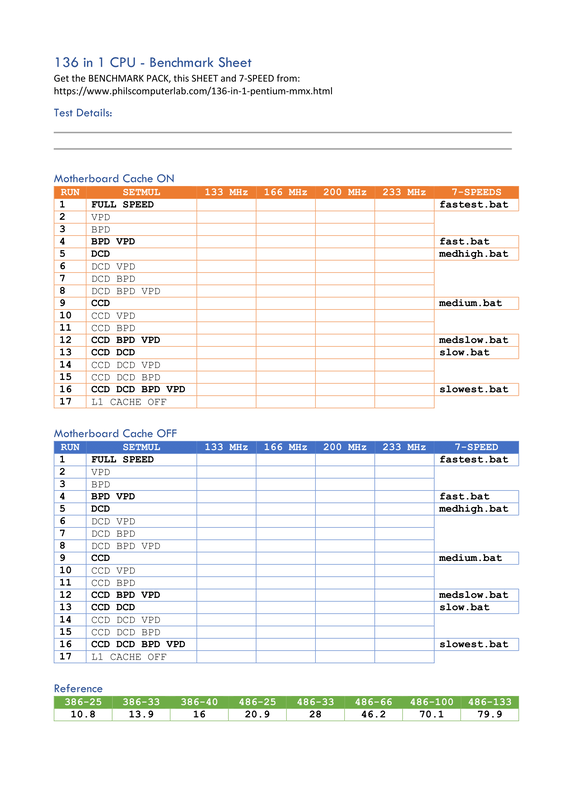 It contains everything needed, the 3DBENCH2 benchmark, the STMLBNCH.BAT automated benchmark for filling out the sheet, SetMul of course and the 7-speeds batch files for easy configuring the speed.